Fully illustrated. 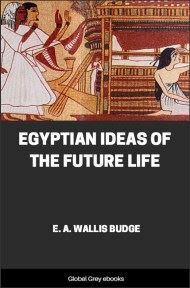 A really interesting look at ancient Egypt and all aspects of it. It's not as scholarly a book as, perhaps the E. A. Wallis Budge ones, but that's not entirely a bad thing. It's very readable and he delves into historical records, religious texts and even gives an account of a day in Memphis. 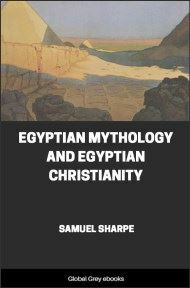 He writes about Amon and Ra, the Golden Age of Egypt, the religion of the stone workers, Amenhotep and Rameses, and he does all this in a page turning format. Includes several chrome plates and 7 colour ones. AT the beginning the world was a waste of water called Nu. and it was the abode of the Great Father. He was Nu, for he was the deep, and he gave being unto the sun god who hath said: "Lo! I am Khepera at dawn, Ra at high noon, and Tum at eventide". The god of brightness first appeared as a shining egg which floated upon the water's breast, and the spirits of the deep, who were the Fathers and the Mothers, were with him there, as he was with Nu, for they were the companions of Nu. Now Ra was greater than Nu from whom he arose. 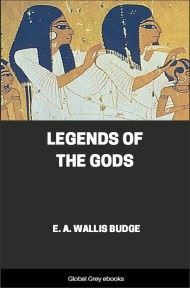 He was the divine father and strong ruler of gods, and those whom he first created, according to his desire, were Shu, the wind god, and his consort Tefnut, who had the head of a lioness and was called "The Spitter" because she sent the rain. In aftertime these two deities shone as stars amidst the constellations of heaven, and they were called "The Twins". Then came into being Seb, the earth god, and Nut, the goddess of the firmament, who became the parents of Osiris and his consort Isis and also of Set and his consort Nepthys. Ra spake at the beginning of Creation, and bade the earth and the heavens to rise out of the waste of water. In the brightness of his majesty they appeared, and Shu, the uplifter, raised. Nut upon high. She formed the vault, which is arched over Seb, the god of earth, who lies prostrate beneath her from where, at the eastern horizon, she is poised upon her toes to where, at the western horizon, bending down with outstretched arms, she rests upon her finger tips. In the darkness are beheld the stars which sparkle upon her body and over her great unwearied limbs. When Ra, according to his desire, uttered the deep thoughts of his mind, that which he named had being. When he gazed into space, that which he desired to see appeared before him. He created all things that move in the waters and upon the dry land. 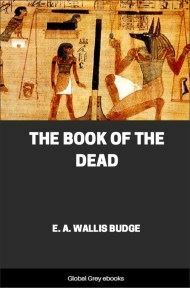 Now, mankind were born from his eye, and Ra, the Creator, who was ruler of the gods, became the first king upon earth. He went about among men; he took form like unto theirs, and to him the centuries were as years. Ra had many names that were not known unto gods or men, and he had one secret name which gave to him his divine power. The goddess Isis, who dwelt in the world as a woman, grew weary of the ways of mankind; she sought rather to be amidst the mighty gods. She was an enchantress, and she desired greatly to have power equal with Ra in the heavens and upon the earth. In her heart, therefore, she yearned to know the secret name of the ruling god, which was hidden in his bosom and was never revealed in speech. Each day Ra walked forth, and the gods who were of his train followed him, and he sat upon his throne and uttered decrees. He had grown old, and as he spake moisture dripped from his mouth and fell upon the ground. Isis followed after him, and when she found his saliva she baked it with the earth on which it lay. In the form of a spear she shaped the substance, and it became a venomous serpent. 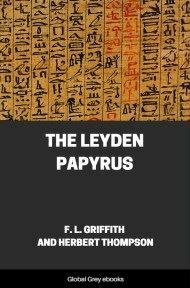 She lifted it up; she cast it from her, and it lay on the path which Ra was wont to traverse when he went up and down his kingdom, surveying that which he had made. 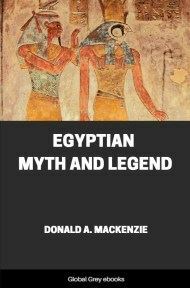 Now the sacred serpent which Isis created was invisible to gods and men. Soon there came a day when Ra, the aged god, walked along the path followed by his companions. He came nigh to the serpent, which awaited him, and the serpent stung him. 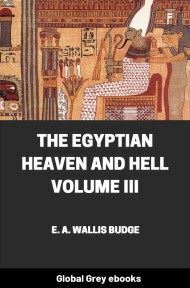 The burning venom entered his body, and Ra was stricken with great pain. A loud and mighty cry broke from his lips, and it was heard in highest heaven. Then spake the gods who were with him, saying: "What hath befallen thee?" and "What thing is there?" "Gather about me, ye who are my children, so that I may make known the grievous thing which hath befallen me even now. I am stricken with great pain by something I know not of . . . by something which I cannot behold. Of that I have knowledge in my heart, for I have not done myself an injury with mine own hand. Lo! I am without power to make known who hath stricken me thus. Never before hath such sorrow and pain been mine." He spake further, saying: "I am a god and the son of a god; I am the Mighty One, son of the Mighty One. Nu, my father, conceived my secret name which giveth me power, and he concealed it in my heart so that no magician might ever know it, and, knowing it, be given power to work evil against me. "As I went forth, even now, beholding, the world which I have created, a malignant thing did bite me. It is not fire, yet it burns in my flesh; it is not water, yet cold is my body and my limbs tremble. Hear me now! My command is that all my children be brought nigh to me so that they may pronounce words of power which shall be felt upon earth and in the heavens."